We are manufacturer of chess product. We have various kind of chess pieces design, colors and sizes. This time we try to offer many different color choices for your chess sets. Our standard colors are natural teak wood color (for white pieces) and transparency dark brown (for black pieces), but if you would like your own color, we [have 16 different colors available that can be produce over 100 different color combination. Just let us know which color combinations you desire. As an example, we show you a set of our wooden chess color in the picture above. The red meets the blue pieces. So different with standard ordinary chess. 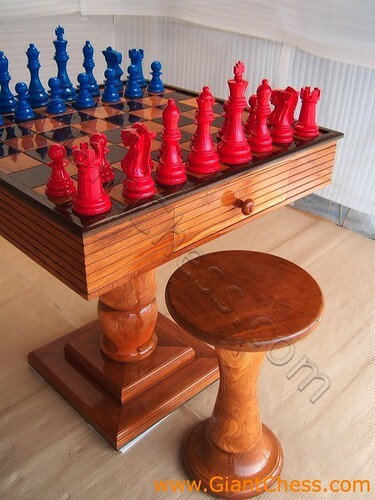 Stand on chess table, make them so interesting and growing desire to try to play with them. Besides, we maho more than 10 couples of chess pieces in different color. Find your favorite color and call us to make it real.